Minnie Thomson Memorial Museum float in the Santa Clause parade. A float entered into the Santa Clause parade. A float entered into the 1972 Santa Clause parade in Oakville. Santa Clause and his reindeer at the Santa Clause Parade in Oakville. "City of the Future" float in the Oakville childrens' parade. Fred Price Construction float. Dominion Day was renamed Canada Day in 1982. A float at the 1966 Santa Clause Parade. Children on a Mexico float in the parade. Candidates for the Playground Queen. Children on a float in the Playground Parade. 3 children on a float at the Playground Parade. Children and a dog on a float in the Playground Parade. 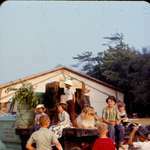 Children on a USSR float in the Playground Parade. A float taking part in Canada's Centennial celebrations.